Alternatively, you can also use watch. -n suppress automatic printing of pattern space, p print the current pattern space, n read/append the next line of input into the pattern space. -n suppress automatic printing of pattern space, 1~2 from the 1st line match every line every 2 steps, p print the current pattern space. sed -n 0~p has the same effect . print only the even lines. When I came here to this room I found this old big tv laying around. 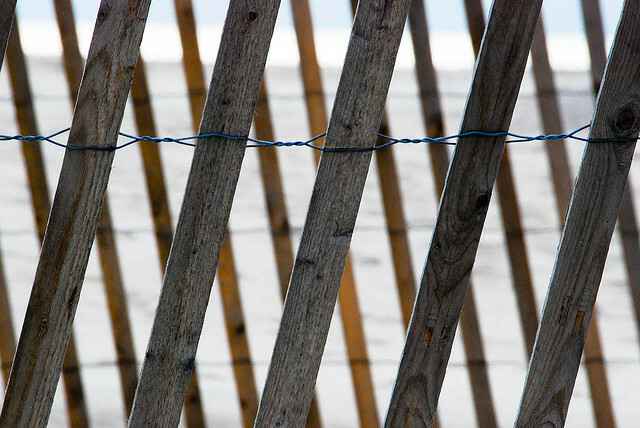 Old but perfectly functional. First I put a tv cable on it with hundreds of channels but after one month I realized that mostly of them are crap and I was watching everything on my laptop (mostly shows from Netflix and BitTorrent). Obviously I wanted to connect my laptop video output on it. As an old television it doesn’t have any HDMI port. It have a RCA video and audio ports so after some research I bought a VGA-to-RCA converter. Besides watch movies on it there is a lot of cool things I could do with it to decorated the room or create a environment while we are jamming. In this article I’ll show how to create a fireplace. 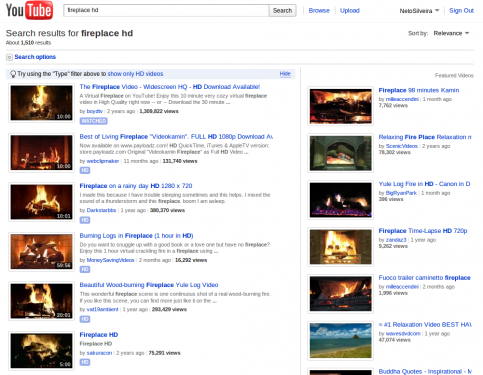 You can search in Youtube for high definition fireplace videos. There is a lot of ways to extract the videos from Youtube and it’s not the point explain it here but I can say one the best ways today is using JDownloader. Using it you can extract sound and video in any available resolution. 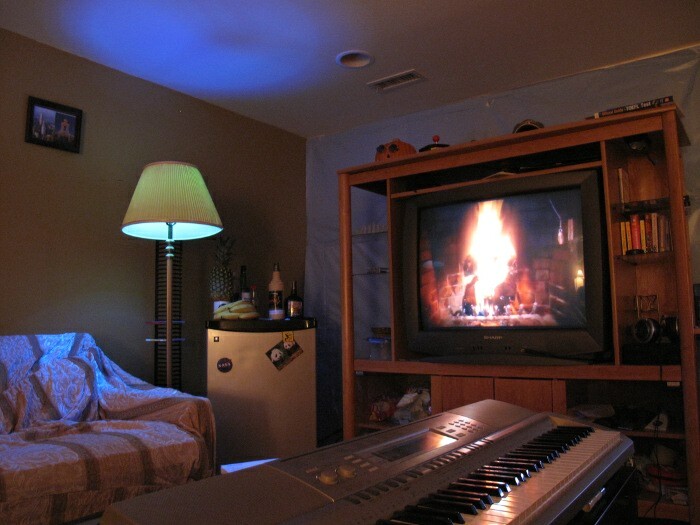 Choose a fireplace video and download the highest resolution available (usually 720p). Here I stored it at /home/silveira/Videos/fireplace_hd.flv. I’m using the TV as a second display in the right. The width of my laptop monitor is 1920. 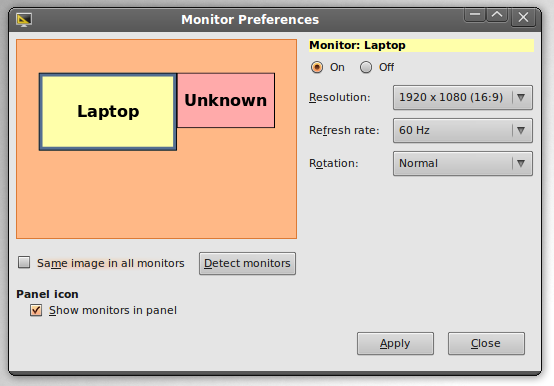 First, right click in the upper panel of Gnome and select Add to Panel. 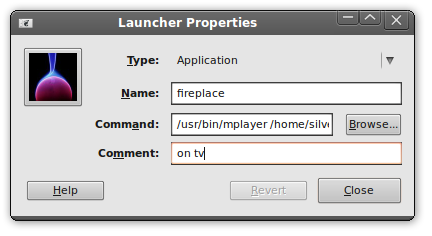 Select the Custom Application Launcher option. /usr/bin/mplayer the mplayer full path (probably you have the same path but you can try “whereis mplayer” in a terminal to find it). /home/silveira/Videos/fireplace_hd.flv as I said, where I put the video. -nosound no sound. :) Usually I have some music playing so I don’t want any fire sound. But if you want the fire crackling sound omit this parameter. -loop 0 the video I took have 10 minutes. If I put -loop 6 it would loop for 1 hour. Zero means infinite times. -geometry +1900+0 you can specify the size of the screen and position but here I’m justing saying I want it on horizontal position 1900 (bigger than my first screen) so it goes to the tv. Now you can use the same idea and make an virtual aquarium, ant farm, an interactive art piece or anything!